I personally believe that the two most critical contributors to achieving project business case outcomes appear at the start and end of our project lifecycles: good requirements analysis, and the strategic application of testing activities. The two of these combined ensure that the project is focusing on creating the right outcomes and that the project is verifying or demonstrating that the outcomes have been achieved to ensure the delivery of optimal business value. The key concept here is “optimization.” Yes, many project activities drive value. Some, however, have an incommensurate effect on the total business value delivered by the project when it is completed. By conducting a Pareto analysis of the most common project activities, we see that creating the right outcomes (proper requirements analysis) and ensuring that those outcomes are achieved (proper testing) have the highest business value to effort ratio. Of the two, I believe that testing gives you the biggest lever. Yes, proper requirements are important, but typically requirements-related activities are only a small portion of the overall project activities and happen at the beginning of a project when everyone – including the business people involved – understand the project environment the least. Testing, however, happens mostly near the end of a project where there is much less uncertainty about what are the desired project outcomes. Testing activities (and the related defect correction efforts) are what determines whether or not the project has been successful. If inadequate testing is performed, then the outcomes created earlier in the project will not drive the proper (or possibly any) business value. Quality assurance (testing) is one of the most critical activities for achieving project success. Similar to under-testing, there is a danger of too much testing, too. We need to find the balance between additional testing and the delivery of an equal (or greater) proportion of business value. At some point during the testing process, additional testing effort will not create enough additional business value to justify the extra expense. 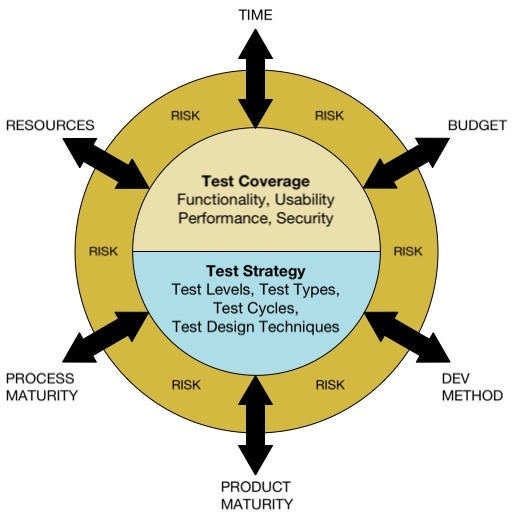 A strategic approach to testing needs to be considered by the project manager when creating the initial project approach. Here is where another Pareto analysis may come in handy. Consider all of the types of testing that we can perform on a project: usability testing, accessibility testing, performance testing (including load and scalability), functional and systems integration testing, disaster recovery testing, etc. – on an individual project, some of these will drive more value than others. We need to consider the business case behind the project to know which types of testing will drive the most business value. For example, perhaps a given project requires rock-solid 24x7 performance or else the business will suffer; in that case, disaster recovery testing may drive a measurable amount of business value, while it may add little value in other, less mission-critical projects. We cannot take the same testing approach on every project – we absolutely need to tailor our testing activities to the individual needs of each project’s business case. In other words, it is essential that we consider testing strategy when we begin planning our project. So, when that company president said that it was project management that drove business value, I believe that if we had the chance to dig a little deeper discuss what was underlying that comment we would have heard that the project manager’s responsibility for project value includes building the right things and then verifying that those things meet the business case needs. And a disciplined focus on testing strategy will ensure that the project has created the planned business value, with the right test strategy ensuring that these validation activities have been performed in an optimal manner.